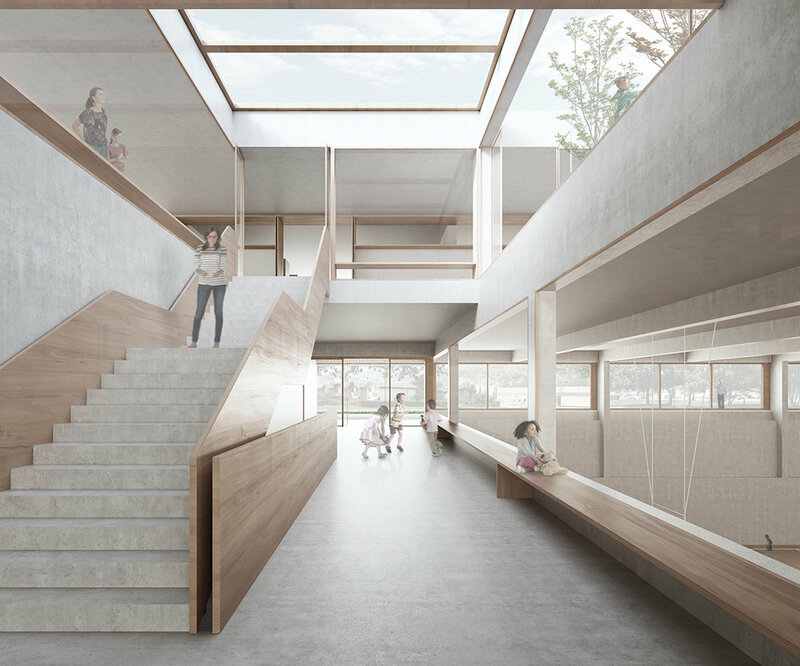 The extension of the school center of Champsec comes to complete the existing school structure within a context in full transformation and relative densification. In this situation, the school complex project responds through a unitary and compact volume that is integrated in a respectful manner. The integration of the three uses, UAPE, double gymnasium, and school, in a single building, favors the economy of the area and allows to have large playgrounds. The relationship with the existing school building is made through the courtyards and crossing the Chemin de Paquerettes. This situation favors the stitching of the two halves of the plot and its understanding as a unitary school complex. The building is organized in four levels: a ground floor of public access where the UAPE is located, a first floor where the classes of the school are planned and two levels of subfloor destined to the room of gymnastics and technical spaces. While each use can function independently depending on their different schedules through their specific accesses, the spatial organization allows all of them to maintain a close relationship as a whole. In this way, the visual relationships between them are emphasized through the common access lobby. In the ground floor lobby, there is an open staircase in double height covered by a skylight. This double height visually connects the gymnasium and the school classes. In addition, this ladder allows easy access to programs located at different levels.